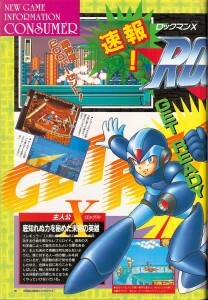 Last week we looked at some previews of the X series from US gaming magazines. But what about from Japan? As promised in Club Capcom’s Spring commencement issue, the Autumn 1993 edition of Capcom’s official Japanese bi-yearly magazine sported a 4 page preview of this highly anticipated game. Many of the designs and screens shown were further along than the “white city” development stage, but not entirely finished. 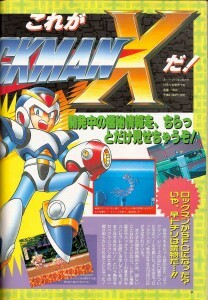 X’s backstory and character design were complete though, and were unveiled here for perhaps the first time ever. Announcement! This is ROCKMAN X! A sneak peek behind this top secret game under development! Rockman’s moved to the SFC? Now now, don’t jump to conclusions just yet…! 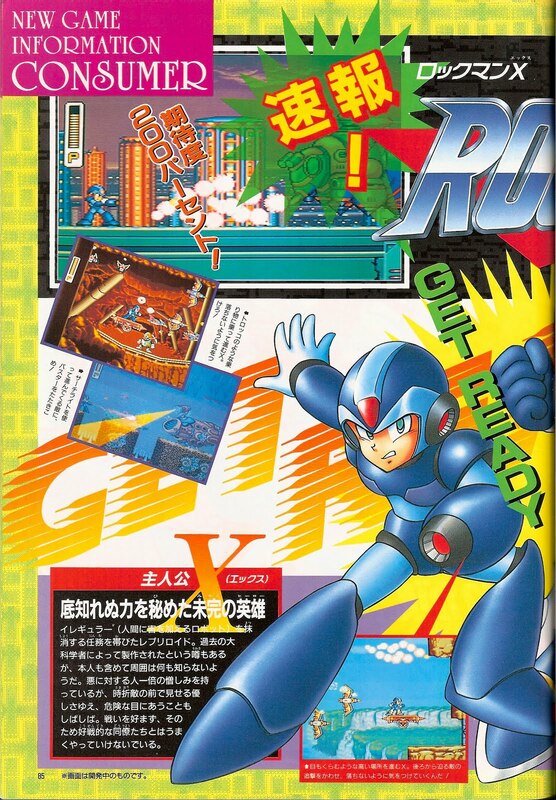 In our story last issue we teased the news of a Rockman series title on the Super Famicom, and now at last we’re pulling back the veil! It’s called “Rockman X”. It is scheduled for release on December 12th of this year. Because it’s still under development, we don’t know all the details just yet. But the basic concept for the setting and backstory have already been decided. Because we know all the passionate Rockman fans out there just can’t stand the long wait until winter, we decided to share what portions we can with you here! The burgeoning hero who conceals a bottomless power! 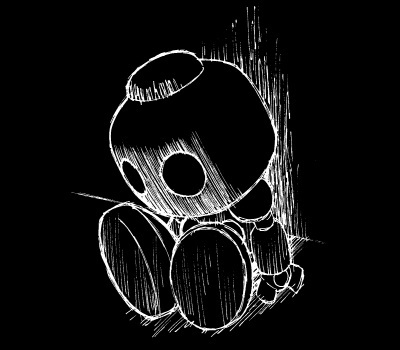 A Repliroid whose sworn mission is to delete Irregulars (robots who inflict harm upon human beings). Rumor has it he was created by a great scientist from the past, but it seems that nobody really knows the whole story, not even he himself. Although he harbors an exceptionally strong hatred for evil, the kind mercy he sometimes shows his enemies frequently lands him in one dangerous situation after another. He dislikes fighting, and for that reason he doesn’t get along well with many of his combative fellow warriors. page 84, top: While underwater, attack this monstrous meandering menace from its blind side! Take aim every chance you get, this enemy is strong! page 84, bottom: A giant robot showdown!? These two colossal characters crash into one another with the force of a super dreadnought! page 85, top: X can ride in style on this railcar-like vehicle. Be careful not to fall off! page 85, middle: Use the buster to knock out on this enemy’s searchlight! page 85, bottom: X must advance over this dizzyingly high terrain! With enemies in hot pursuit, he’ll have to take extra care not to fall while fighting off attacks from behind! *Screens are from an unfinished version. A few of these screens differ from the final in details like the “P” on the lifebar and the shape and color of the charged shots coming from X’s normal buster. Interesting, but nothing too ground-breaking yet. Not to worry, though. There’s still more to come! Next time, we’ll turn the page and have a little Q&A session with the X dev team, and even uncover some boss and enemy concept art. X-cited yet? 2 Comments to "This was Rockman X!" Late to the par-tay on this one, but here’s something I find interesting: The English instruction booklet for Maverick Hunter X mentions that X doesn’t get along with his fellow Hunters. It never really clarified why, but this little tidbit reveals the reason lies behind his pacifistic nature, which contrasts with the nature of his more bloodthirsty companions. Whaddaya know, I did a learning! Better late than never! I almost thought this little shindig was a bust. Guess nobody wants to hang out with some B-class whiner. You think his fellow soldiers would have liked him better in X8 and Command Mission?